Since getting a bed in the bedroom (sneak peek of the bedroom)I feel the whole apartment has finally come together, it feels much more like home now than it did when I first moved in July. I love spending time in here now, and since I have been a little bit sick last few weeks I have been working from bed much more than I would normally do. 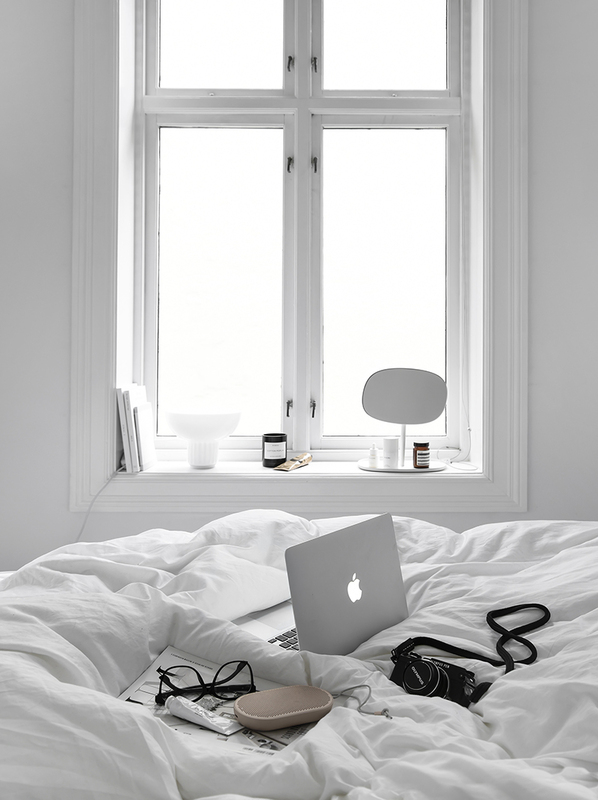 I don’t have a speaker in Oslo for my bedroom so the new portable Beoplay P2 has become my best companion ( mine is in color Sand ). It doesnt have any controls on it, but tap it twice to pause any song ( double tap again to resume ) and shake it sideways to skip a song are all the controls I need 🙂 It also has a microphone so when I get calls I dont even need to pick up my phone! I always take it with me when I travel too, it is lightweight and then I can listen to music or podcasts or audio books while in my hotel room, its a win win. The sound is great as well for such a small speaker, it is now firmly on my essentials list. 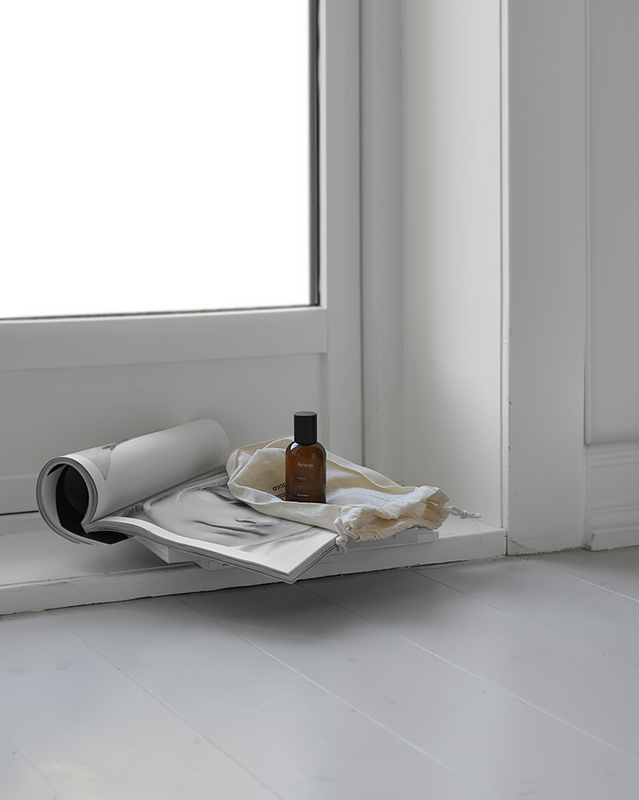 To make the bedroom a little cosy, I like having a candle on the windowsill next to the bed (the bedroom has two big windows), and with some books and magazines, a mirror and a lamp the scene is almost complete. On the window you might have noticed some products, they are from the Nuori face care line, the Perfecting face oil on the left and the Supreme moisture mask on the right. 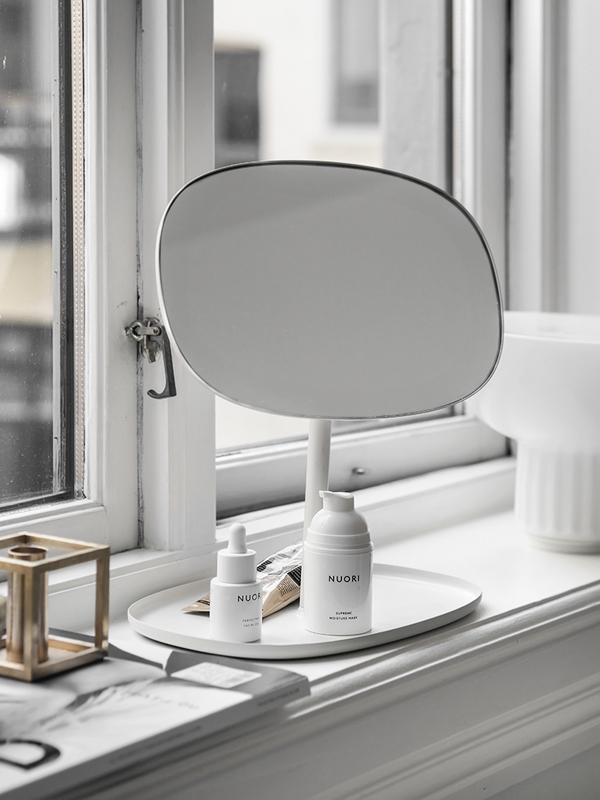 If you don’t know about Nuori already, apart from their super minimalistic design, what distinguishes them from other skincare is that their products are always fresh. Mine were mixed right before they were delivered and their ingredients are 100% natural. A lot of brands claim this to be true, but Nuori actually delivers, read more about it here if you want and I promise you , you will be converted.